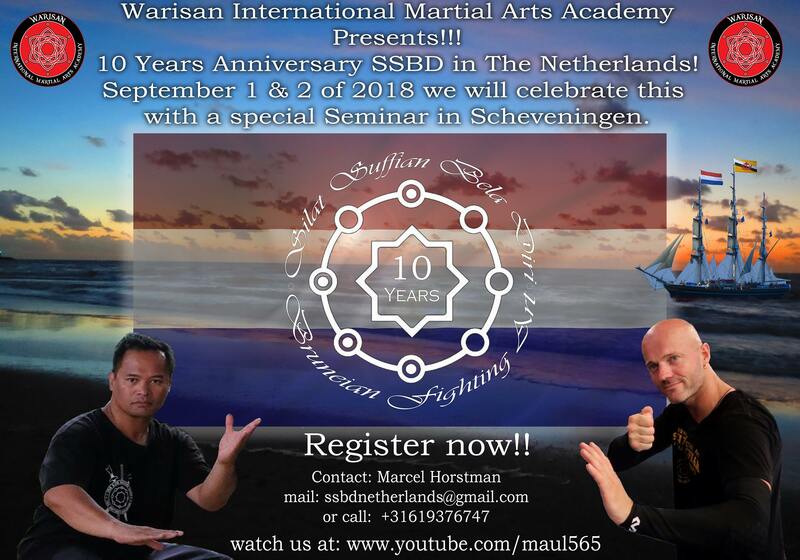 10 Years Anniversary SSBD Seminar in the Netherlands with Guru Maul Mornie. This event will take place on the 1th & 2th of September 2018. We are going to cover different topics and different weapons. We will have people from all over the world joining this amazing event. Don’t miss it!! For fast thinkers (early birds) we have the coupons included (For those who register and pay in advance for the whole Seminar which means for both days) this offer will last until one week before the seminar starts untill August 24. After 24th of August we will charge the regular prices of €70,- per day and as an option you can buy the coupons for €5,- per day when you pay in advance. For door tickets please read below. The program will be presented on the day itself. It also depends to the group and how fast they pick up the drills we do to go more advanced into the skills. We will provide you coupons with the registration for only €5,- per day per person, which includes water, fresh fruits, small snacks and unlimited lunch. The coupons can be used the whole day. The €70,- per day is only valid if you pay in advance at least 1 week before the seminar starts. Deadline is August 24 on this day the money need to be on the given account in the details of this event. For the next Seminars that we organize the rate will be higher, €70,- per day per person (Coupons €5,- per day not included) due the rate of the flight tickets and other expenses which have influence on the total cost to make this event possible. Door tickets will be €80,- for the next coming seminars in September and November even if you have registered yourself in advance and pay at the event. So make sure you make the payment in advance if you want to have the regular price mentioned above for this event and the next events. If you cancel within 24 hours or less, refunds can not be guaranteed. This entry was posted in Seminars on 23/07/2018 by Marcel Horstman. 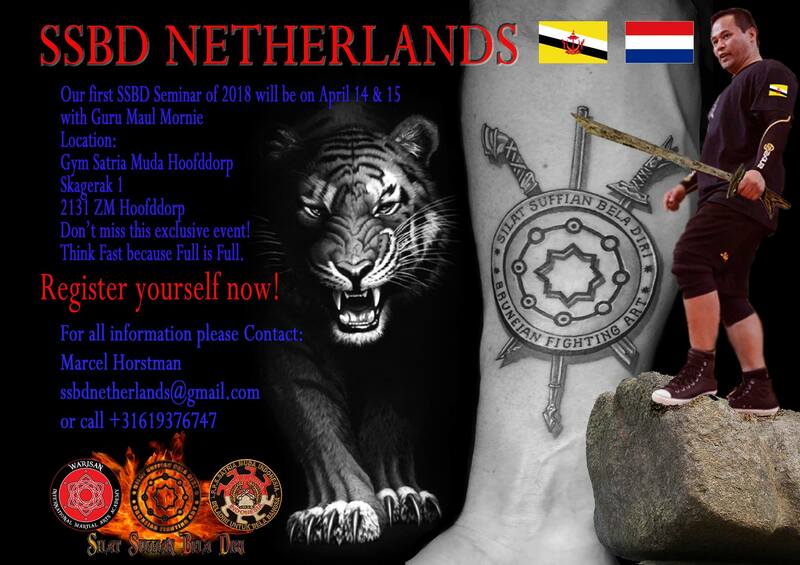 A Multiple Weapon SSBD Seminar in the Netherlands with Guru Maul Mornie. This event will take place on the 14th & 15th of April 2018. This will be an Exclusive 2 Days Open for Public SSBD Seminar with Maul Mornie. For fast thinkers (early birds) we have the coupons included (For those who register and pay in advance) this offer will last until one week before the seminar starts. After this we will just charge the regular prices of €60,- per day and as an option you can buy the coupons for €5,- per day. e registration for only €5,- per day per person, which includes water, fresh fruits, small snacks and unlimited lunch. The coupons can be used the whole day. The person who has the list can be Marcel Horstman or Karin Huizer or one of their assistants for that day. If you have registered and paid in advance than your name will be there on that list. This entry was posted in Seminars on 21/02/2018 by Silat Suffian.